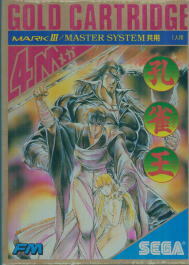 Spellcaster seems to be based off of the manga series Kujaku-Ou (Peacock King.) It came out in 1988 in Japan, and 1989 in the US. 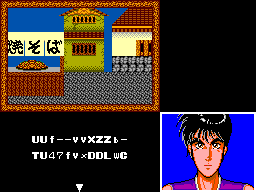 It’s basically a text adventure interface mixed in with a side scrolling action game. The Japanese cover of the game definitely shows the manga roots. Since the side scrolling sections use fireballs from the hero, they feel a bit closer to a clunky shooter. Talking sections of the game mostly amount to looking at stuff to find people to talk to, getting keywords for locations, and then travelling to said locations. The blue fireball is an uncharged attack from the hero. If you charge the attack, it is much more impressive. Despite the light RPG elements in the game, it is pretty attractive game. 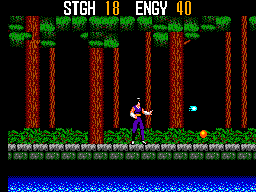 Enemies tend to have a strong color contrast from the backgrounds in the early sections of the game. This helps for attacking. Music is a fairly typical chiptune affair. 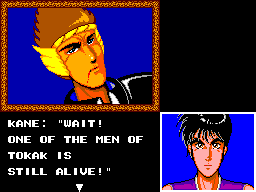 Like many games from this era, blood and death are not heavily censored in Sega games. I think the most interesting thing about the game is the small touches. 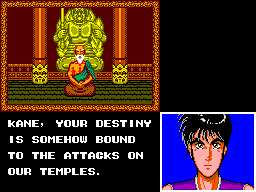 Characters have a talking animation, for example, and many scenes have a unique picture for the character. Stairs are treated a bit like Castlevania, in that you can press up to climb them, and you can walk in front of where the stairs are. Having fairly smooth scrolling, and this two layered effect on areas is pretty nice for a 1988 era game. I'm pretty sure that you're basically talking to the gods when you generate a password. Unfortunately, the password is pretty complex. That is not to say that this game is an undiscovered gem. The jumping feels floaty and awkward, and there’s some pretty annoying enemy knockback. Examining places in the text adventure mode includes a terrain and a “at what” mode. Even if you look around and see the spaghetti shop, for example, you aren’t triggering the “examining shop” flag until you use “at what” to specifically select it. There’s no proper save system, and instead there’s a fairly long and tedious password. Back in the day, I bet this game was pretty impressive and fun to play. By modern standards, it’d definitely fall more into the action end of an action RPG, and definitely would be seen as dated. I'm constantly impressed with the amount of text that they can fit in the text boxes of this game. It really does give the script a polished feel.